Why not use your Trabasack as a wheelchair food tray? If you’re a wheelchair user then you there has probably been many occasions when you have had trouble finding a suitable table whilst out. You appreciate that you may not always be able to get your legs under a low table or find an accessible space to eat. There are many times you might just want to stop for a snack or a hot drink but it becomes difficult in areas where there aren’t places where they have though about the needs of wheelchair users. With a Trabasack you won’t have to encounter this problem again! A Trabasack is a new design created by a wheelchair user. It is a versatile wheelchair lap tray which has the additional bonus of a bag to carry your possesions. A smart and practical new invention, Trabasack combines a handy travel bag with a bean bag lap tray which means you can eat on the go wherever you are with reaching or stretching over unsuitable tables. Trabasack is extremely easy to carry, sleek and created to fit the contours of your waist. It is adaptable with a choice of straps so that it fits to you rather that your chair. So because all wheelchairs are so different and you don’t need to worry about it being unsuitable with your particular chair. Whenever you’re out and about and you fancy a drink or a sandwich, you can simply stop and conveniently use your lap tray to have your lunch or snack, no need to worry about finding a picnic area or food court. It’s a really great accessory for modern living. You never know where you will need one, this is Harrods Foodhall! Trabasack has received great reviews across the Internet, on many personal blogs of users and the parents of users as well as more recently on Amazon. There are some extremely positive reviews on Amazon describing the Trabasack as both “the best invention ever” that one user doesn’t “go anywhere without it.” These are truly testaments to the quality of the Trabasack and how it really becomes an essential piece of kit for many of its users. 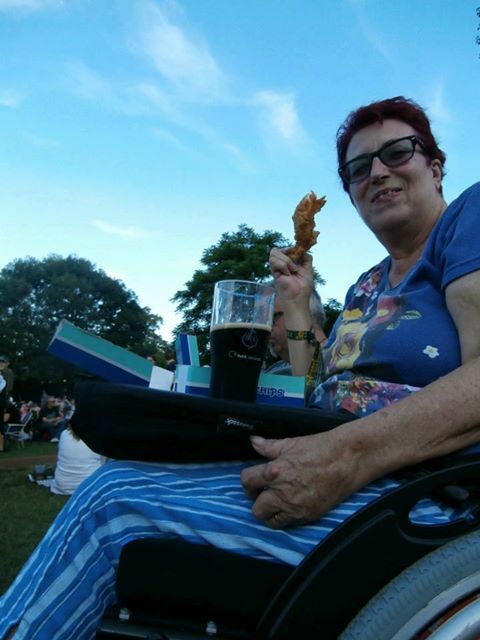 Next time you fancy a snack or perhaps a beer in a busy pub, don’t worry about finding a table, just whip out your Trabasack and you’ve got a portable table or wheelchair food tray wherever you go.